The Future – Ya Like Dags? Posts have been a little sparse here for the past month or so, and it’s because I’ve been spending a lot of time a.) finishing up my first year of PhD school, and b.) setting up a new batch of projects set that will keep me busy and provide fodder to write about for the next, oh, 2-5 years or so. If you’re curious as to how my old projects turned out, check out the previous post on my recently-posted Master’s thesis (Open Access, for those who would like to read it at home). Starting this summer, I’ll be working on the first to two projects for the next academic year, which will see my research branching out to include many shark species in addition to my old friend Squalus acanthias. I will be putting my hands this perilously close to shark teeth this summer. So the big plan for my dissertation (hopefully not totally jinxed by talking about it in public) is to survey North Carolina’s estuaries for shark nursery habitat. 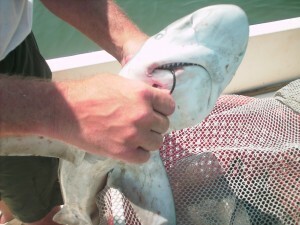 Last summer I rode along on a couple longline/gillnet/drumline trips to see how the business of shark catching is done. Now it’s my turn. This summer I’ll be setting gillnets and longlines around Pamlico Sound to see if there are any juvenile sharks hanging around, and may use a little acoustic tracking to see where they go. The hope is that I’ll be able to identify certain areas where the sharks are consistently, and concentrate on those areas year-round for the next couple years. The goal is to identify spatial and seasonal patterns in species abundance, age groups, and maybe even birthing time for the sharks of North Carolina. This is the type of project I’ve always wanted to do and I’m excited to get the chance to try it out. Unpleasant. But I'm sure it beats getting cut open. While the summer project will be moving ahead on my dissertation, I’ll be doing a side project of sorts over the winter that will add to my Master’s work. An important part of any stock assessment is determining the natural mortality of the fish. In true, comprehensive, ecosystem-based management, this involves figuring out what that fish’s main predators are and how many are lost to the mouths and stomachs of those predators every year. 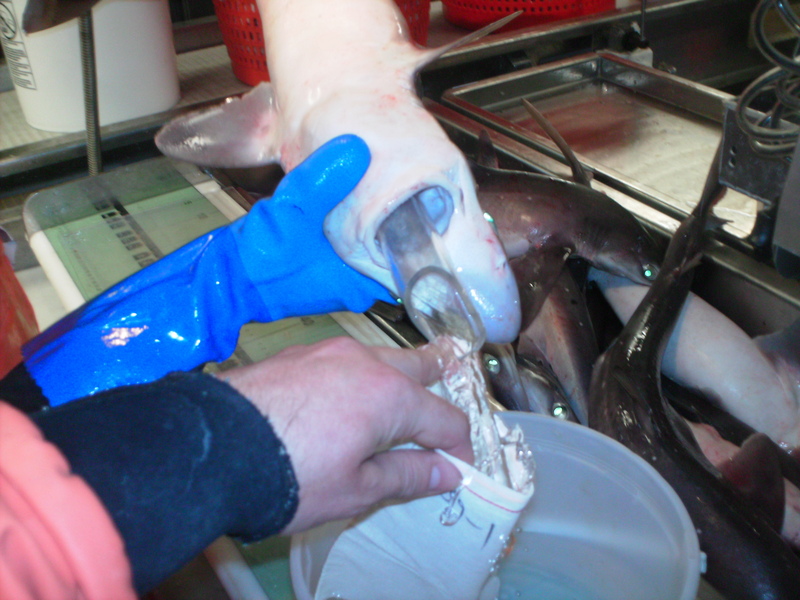 Spiny dogfish, as my thesis found, are a major predator of a few key species, and in order to figure out the predatory impact of dogfish, you need to know how much food they eat. To figure out how much food they eat, you need to know how much they need, which requires knowing how fast they digest their prey. Still following? For this project I’ll be working on that very basic question for Atlantic spiny dogfish. Currently, the daily ration for dogfish is based off of the North Pacific population, which grows slower, lives longer, and is now recognized as a different species. To accomplish this, I’ll be keeping several dogfish in captivity and feeding them pre-weighed amounts of food. Then I’ll make them puke using the nonlethal tube lavage technique from my thesis. This is advantageous because a.) it doesn’t kill the shark, and b.) it allows multiple trials on the same shark. Don’t worry folks, I’m a confirmed dogfish hugger (watch out for the spines), so I will be making every effort to make sure my guests stay well-fed and healthy until release, despite having to yak up their lunch on a regular basis. So that’s what I’ll be keeping you all updated on in the next year or so. There will of course continue to be posts on sharks in the news, nifty research, and things I find funny. As always, thanks for reading. Pingback: Summer of the Shark: Prologue | Ya Like Dags?